The mid-sized floor stander in the Diamond 11 Series, the 11.4 sits snugly in between the 11.3 and 11.5 models. The model enjoys a stunning curved cabinet design and a precise crossover. 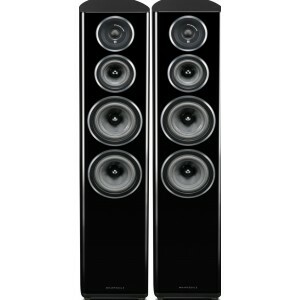 Wharfedale Diamond 11.4 Speakers (Pair) are the mid-sized floorstanders in the Diamond 11 Series, sitting above the 11.3 and below the 11.5. Like its fellow models in the Diamond 11 Series, the 11.4 showcases a brilliantly sleek curved cabinet design that pays homage to the earlier Diamond 9 and 10 Series. The new and upgraded Diamond 11 Series marks the next chapter of this iconic range's illustrious history and perfectly celebrates Wharfedale's 85th birthday. The Diamond 11 Series is made from a sandwich of woods of differing density, which offers premium acoustic characteristics and a sublime standard of finish. The beloved curved cabinet walls boost acoustic performance alongside the speakers’ sophisticated aesthetic qualities. A rich and articulated well-integrated bass with an absence of ‘chuffing’ is deliivered by an updated version of Wharfedale's slot-loaded distributed port. An intricately and precisely derived crossover takes the driver units on this system to the next level. Wharfedale’s engineers utilise an evolved virtual crossover software system which creates a number of circuit options for blending the bass/midrange and treble units in a smooth manner. These circuit options are then evaluated using thorough listening tests over a period of months, involving a wide range of music. Once the final circuit strategy has been chosen, the design team fine tunes the crossover components and the circuit board layout to produce the most accurately detailed musical performance. Superb technical design combined with attention to detail gives Wharfedale Diamond speakers their enduring appeal in the accessible sector of the hi-fi market. The majority of affordable speaker systems are based on drive units that are developed according to a price, whereas Wharfedale believed that Diamond drivers should be aimed at performance. As a result, the Diamond 11 Series showcases advanced driver systems that include elements that normally only find their way into high-end loudspeakers. At the beginning of the design process, Wharfedale’s engineers were determined to create a loudspeaker system that would once again enliven this sector of the hi-fi market and bring high-end performance and finesse within reach of the majority of audiophiles.